I used to get lost when driving to Jamaica Plain, a neighborhood of Boston. It is not even far from downtown. Yet the winding roads crossing each other at Fenway always look like a maze to me. I found a way to remember however, telling myself secretly as I drive in the two-lane road that I should “stick by the river, and I will be fine”. It seems to have done the trick. Or maybe I have learned to memorize the way since we have recently spent quite a few evenings in one of our favorite dining spots. I remember the first time when I walked along Center street, known as the main street of Jamaica Plain. In fact, I can still remember the first time when I had a peak through the window of the restaurant Ten Tables. Was it really “it”? A room with only ten tables placed close the ones to the others, with an open kitchen in the back, where you can feed your curiosity by observing, from the corner of your eye, what is going on in the food preparation stage. If you did not know about the place, or had not heard about it, you might not even stop there. Well maybe not. Small, quaint, Ten Tables is an adorable local restaurant where you can have a casual comfortable, yet elegant meal, comme à la maison. Every time we go, we are welcomed by an excellent friendly waiting staff, and of course, delectable food. Last week, it became even better. Not only did we dine there once, starting Friday night with Alli and Yoav, but we went back again on Sunday as we had a special occasion to honor. Since the talented Lara, as friendly as sensed from her blog Cook & Eat, and her husband Cam were visiting Boston, I thought about taking them to Ten Tables right away. We would not mind a second dinner there for sure, especially as I knew we would end up spending some time chatting with David Punch, the chef. Ten Tables is that type of friendly place. We enjoyed celery root soup and grapefruit granité mise-en-bouche, green lentils and Toulouse sausage, homemade charcuterie — yes, they smoke their meat on the premises — culotte steak with Yukon potatoes and bone marrow, Homemade Gnocchi and Root Vegetables — bummer they were out of their oxtail — Arctic Char with Meyer lemon salsa on a bed of Farro and Beets with fresh salads and a nice bottle of Chateau Neuf du Pape, followed by crème caramel, rosemary ice cream, and spiced rice pudding. The evening was delightful, but I was just half surprised really as I still vividly remembered the great time we had had when we visited Lara and Cam in Seattle last September. Once more, as we were the last people to leave the restaurant, I left the place feeling inspired from gorgeous food and company. Happy. And on our way home, ideas kept coming. In fact, I already knew that I would get a special request from P. Ten years spent together helps you get to those things right away. You know without asking or saying it. How could we not fall in love with the marvelous spices found in this delicious dessert? Rice pudding of that sort is simply our type of dessert. As I concentrated to mentally write the recipe, I focused to try to visualize every bite we had had. I remembered round rice grains enveloped in a delicious silky vanilla and cardamom flavored milk , various nuts and dried raisins soaked in the juice, scents of coconut, giving you the impression that all of sudden, you had managed to escape and travel to a middle-Eastern country, far away. Memories of my trips to Turkey or Tunisia came back to me. I had the recipe in my head. I had to make it. Place the milk, vanilla pod and seeds, and cardamom pods in a pot. Bring to a gentle boil. Rinse the rice under cold water and when the milk starts to boil, pour the rice in the pot. Reduce the heat and cover, cooking for 30 mns on low heat. Check occasionally to make sure the rice does not stick to the bottom. After this time, remove from the heat and check if the rice is cooked. Add the sugar with 1 Tbsp of grated coconut. Remove the vanilla bean and cardamom pods. Add the cranberries and mix together gently. Serve the rice in small ramekins, topped with pistachios and almonds. Spinkle with grated coconut. Note: I think this dessert is nicer if served lukewarm to warm. Also, 2 2/10 oz rice provides a juicy rice pudding. I like it this way. If you prefer it less juicy, add more rice. Mettez le lait, la gousse de vanille et les capsules de cardamome dans une casserole et portez à peine à ébullition. Rinsez le riz sous l’eau froide et dès que le lait commence à bouillir, versez-le dans la casserole. Couvrez et faites cuire à feu doux pendant 30 mns environ. Surveillez et au besoin réduisez le feu, afin d’éviter que le riz n’attache. Après ce temps, vérifiez la cuisson du riz et ajoutez le sucre et 1 càs de noix de coco râpée. Mélangez bien et retirez les capsules de cardamome et la gousse de vanille. Ajoutez les canneberges et mélangez délicatement. Faites griller les amandes à sec dans une poêle. Décortiquez les pistaches et concassez-les grossièrement. Servez le riz au lait dans des ramequins avec les pistaches et les amandes. Saupoudrez de noix de coco. Remarque : je trouve que ce dessert est meilleur mangé tiède ou légèrement chaud. De plus, 60 g de riz donne un riz au lait plus juteux. Je préfère le riz au lait comme cela, mais vous pouvez ajouter plus de riz si vous le préfèrez moins juteux. You have until today, Wednesday, January 10th 2007, 10:00 PM Eastern Standard Time (GMT-5) to nominate your favorite blogs, all types, styles etc… The nomination form can be found here. Vous avez jusqu’à aujourd’hui, mercredi 10 janvier 2007, 10 heures heure de la côte est américaine pour nominer vos blogs favoris, tous genres confondus. Le formulaire à remplir se trouve ici. Congratulations on the Food Blog Award. No question about it, your photos are outstanding. moi le riz au lait, je l’aime crémeux, nature, parfumé à la vanille.. et froid! un doux dessert d’enfance sans prétention mais tellement bon! Dans ta version parfumée, je verrais bien du safran pour une couleur chaude qui va si bien aux epices que tu as choisies, non? Congratulations dear Bea on the Food Blog Awards! J’aime beaucoup ta version de riz au lait. Moi aussi, je l’aime également tiède avec juste un peu de sucre et de cannelle. Fabulous recipe. I love the addition of the fruits and nuts. Bea, rice pudding reminds me of my mom. She used to make it for me but I liked to eat really hot with a ton of cinnamon sprinkled on top. So delicious. Your version must taste wonderful. Congratulations for your Best Photography award! C’est réellement le riz au lait comme je les aime, parfumé, si coloré ! I’ve made rice pudding with cardamom before, but never added dried cranberries. What a beautiful burst of color it adds to the dish! So perfect for these cold, wintry days. How appropriate that such a gorgeous photo tops your blog on the day you win Best Food Photography! I’m a big admirer of your work, and send you a hearty congratulations. Fan de riz au lait, ta version me fait craquer. A essayer sans hésiter. si je te dis que malgré les nombreuses recettes alléchantes aperçues sur les blogs, je n’ai encore jamais gouté de vrai riz au lait? je sais, c’est la honte, mais je t’assure qu’en voyant ta version, la cardamome et le reste, je ne vais plus résister! oh et pareil, j’ai oublié de te féliciter! je suis aux anges pour toi! Je fais pratiquement le même riz au lait. J’aime beaucoup le parfum que dégage la cardamome. Je remplace souvent les canneberges par des cacahuètes écrasées et j’ajoute de gros raisins secs. Un pur délice…les choses simples sont parfois les meilleures! Gorn is always after me to make rice pudding, I think this one may do it! Love the color in the photos!! Congratulations, Bea, on the food blog award for best photos — for sure, your photography makes food seem every so dreamy! Gorgeous photos (as always)! I love the ramekin in the background. there’s a new restaurant in town that uses the same ones for a trio of gelati. This sounds fabulous and I love your photos! What a beautiful write-up, and I love everything in this recipe! Congrats on the FBA win! Your photos are so gorgeous, I knew it had to be you! congrats on the bood blog award! your photos are alway incredible! and yum! I haven’t been to Ten Tables for ages. Thanks for reminding me what a special place it is. Congrats on your blog award — richly deserved. Un riz au lait comme ça, c’est sur je l’adopte! 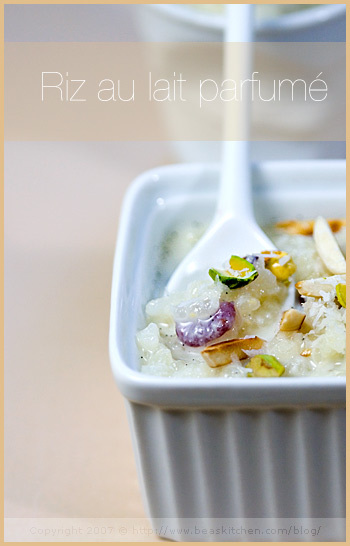 Rice pudding is one of my favorite desserts. I usually use Chinese glutinous rice, but I’ll try the risotto rice next time. It sounds like it works very well. Congratulations on your well-deserved wins!! I am so very pleased 🙂 And thanks for sharign this great recipe and its glamorous pictures. 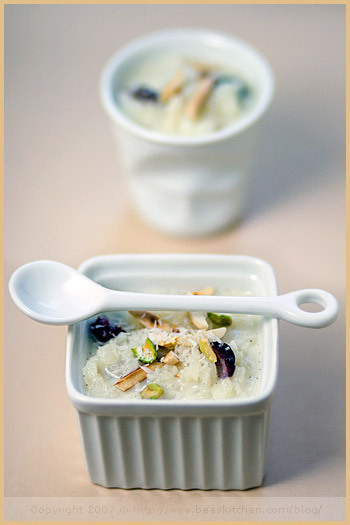 A friend of mine simply ADORES rice pudding and I will definitely make this for her niext tiem we get together. Jamais je n’avais mangé et fait de riz au lait si parfumé. Il en reste un peu. Ce sera pour demain matin pour le petit-dej.